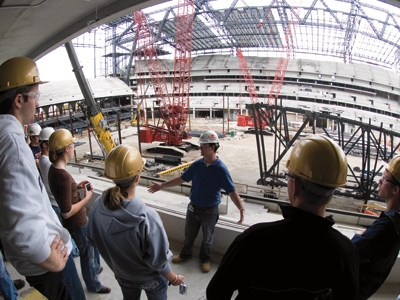 A freshman engineering class gets an up-close look at the new Colts home on the rise. You want to talk about looming deadlines? Suppose your office had a giant digital clock in the conference room, counting down the days, hours, minutes, and seconds of a project-due date. And just so visitors could take note, too, an identical clock clicks off the seconds in the reception area. So tick the timepieces in the downtown Indianapolis construction offices of the Hunt Construction Group, builders of the rising Lucas Oil Stadium - 323 days, 16 hours, 9 minutes, 22.8 seconds, and counting. 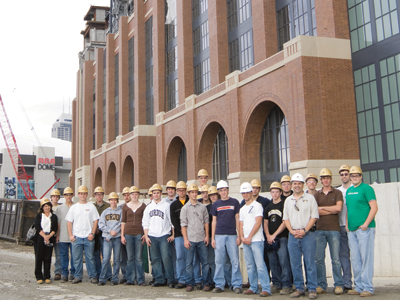 But there was little pressure on 24 freshman engineering students, simply here for a tour of the new Colts stadium. The quiet group entered the stadium with the brick exterior walls already in place. They saw: on a dirt-covered field - still long before Peyton Manning can hit Marvin Harrison in perfect stride crossing over the middle - giant cranes which have helped place three of five steel trusses that form the peak of a retractable roof. They walked through the Colts locker room, looking more like an unfinished basement at this point, got a view of the soon-to-be 50-yard line from one of the 140 suites, and spied what Colts fans will see when a north-side window opens up like a sliding glass door: the Indianapolis skyline. Pretty tasty as far as field trips go. The class, Engineering 103, also known as "Civil Engineering in Action," is taught by Bryan Hubbard, director of industrial relations. Hubbard's two-fold mission: to increase the number of freshmen making the leap to the School of Civil Engineering and introduce them to the possibilities of a civil engineering career. "It's difficult in the classroom to explain the size and scale of a project like this," Hubbard says. "Even the 'Building Big'-type shows can't match what you see in person." For the management team from Hunt, assisted by the Indianapolis-based firms Smoot Construction and Mezzetta Construction, the massive undertaking is a familiar enterprise. The number-one builder of sports facilities, according to Engineering-News Record magazine, Hunt has built retractable roof baseball stadiums in Phoenix (Chase Field), Seattle (Safeco Field), and Milwaukee (Miller Park). In addition to Lucas Oil Stadium, they're also building a new multipurpose facility and home for the Arizona Cardinals of the National Football League (NFL). Familiarity, however, doesn't necessarily make for a build without problems. Chad Hobson (BSCT '90), the project manager overseeing all the outdoor and indoor civil work, says they experienced problems as soon as they started digging a big hole in the ground. "We ran into a lot of unforeseen conditions in the excavation," Hobson says. "We had about a half a million cubic yards of dirt that we hauled out of the hole." The ground, in turn, turned up remnants of materials that had been on the site for hundreds of years-everything from old railroad stations to gas manufacturing plants to coal mining facilities. The stadium is also being designed to sit on top of Pogue's Run, a waterway 40 feet wide and 15 feet tall that runs under downtown on its way to the White River. Rather than relocate or build around the run, designers decided to build over it, Hobson says, saving millions of dollars and much precious time. And if everything comes in on time, Lucas Oil Stadium should pay off handsomely for the city of Indianapolis. In addition to football, NCAA basketball, conventions, trade shows, monster truck extravaganzas, and more will come to the multipurpose facility. The Colts have outgrown the RCA Dome, currently one of the smallest venues in the NFL, and the size and numbers of the new seven-level stadium are impressive. Up to 63,000 football fans will have access to larger entrances and public concourses, 14 escalators, and 11 passenger elevators, wider seats with more space between rows, 148 concessions stands, and 1,400 toilets. Who knows what lurked in the minds of the students on the site? Wrestling with decisions on what majors to choose and miles to go before they work, the freshman bunch stood mostly silent when tour leaders called for questions. Hubbard, however, couldn't resist - after it was all said and done - asking one young man what he thought, if he had fun. Straight-faced, the freshman replied, "It was the experience of a lifetime." An educational experience, Hubbard hopes, to be repeated in the coming years by many from the class in paid internships and big builds throughout construction careers.